That probably explains in popularity of the Subway chain in France, who offers something different from the French classics. According to their website, they now have around 66 outlets in Paris. But I’m not joining the lines, though, because it’s where I had one of the worst sandwiches of my life back in the states. You’d think it’s pretty hard to f-up a sandwich. Thankfully, things have taken a turn for the better. So for those who say les sandwiches lack creativity, you’ll be pleased to know that a number of places have popped up in Paris, such as Pressing, a food truck that is doing Panini sandwiches, and Abri, which I’ve yet to go to, but is doing what folks tell me are great sandwiches, but only for Saturday lunch (no reservations). And I just passed a branch of the bakery chain Paul that has put out a sign that they’re offering hot sandwiches, too. But when I heard that Verjus was doing them as well, and daily, and one included fried chicken, I could barely wait to get my derrière over there. My all-time favorite food is fried chicken, but I guess I’m not the only one around here. Because a few nights ago, it was funny to see two ‘ipsters near the Place de la République (in French, the “h” is silent) toting budging bags of KFC. I’m not sure hipsters in Brooklyn or Portland would do that, nor would I (well, maybe if no one was looking…) but I felt their pain and was really jonesing to get my fried chicken fix. So I headed to Verjus for le sandwich poulet frit. There are three sandwiches on the menu at Verjus, each an homage to a different style of cooking. At present, one is pulled pork, another is fried chicken, and the other is very crisp pork belly with hoisin sauce, à la David Chang, which I went back and had the following week. (It’s kind of spicy, and probably my favorite.) It’s €15 for a sandwich, drink, and cookies, or a brownie, or whatever sweet they are making that day, to eat in. Or you can take it to go, and eat in the nearby Palais-Royal. 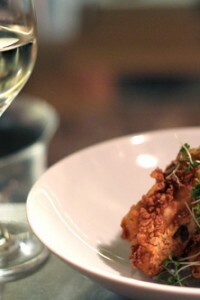 My fried chicken was just what I wanted, although I wouldn’t have minded a pile of the great Verjus fries alongside. And if they’d have added a few pickles, too, well, I’d have been even happier. 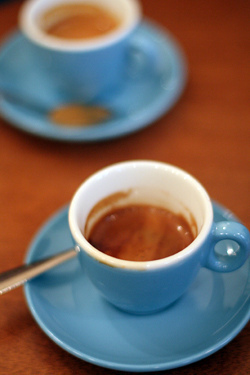 Afterward, you can head over to Telescope for a coffee, one of the newer places in Paris that is focusing their efforts on making quality espresso. We were early for lunch so had our coffee first. And while having coffee before lunch probably isn’t very Parisian, it’s nice to know that fried chicken finally is. Sandwiches available in the wine bar Tuesday through Friday, 12:30 to 4pm. As a child of the Deep South in the USA, it’s hard for me to decide which sandwich I would choose. Fried chicken? Pulled pork? Crispy, spicy pork belly? Be still my heart! A veritable “gone to heaven” group of sandwiches. A few pickles would go nicely on all three, but from the pictures you have I find it hard to find fault with any of them. What are the little round red items on the pulled pork? A good vinegar slaw would certainly go well with the pork. But that’s just my heritage talking! Beautiful pictures! Hi Dave………..I’ll pick up some Popeye’s for you.. I just ate at Verjus last week and was very happy with my meal – the fried chicken was absolutely fantastic and had me wondering how silly I would look ordering seconds. Just had a flash of Maagnchi doing swimmingly well selling her different fried chickens out a window, comme L’As du Fallafel, in Paris. Who knew Parisiens were into the KFC? And Subway? I was wandering in as you and Heather were leaving on Thursday, but was so distracted by the friend chicken that I didn’t bother to say HI. I see your lunch was just as good as mine, though I agree with you about the frites–would be the perfect way to round out the meal ! The Paul main store in Lyons has fantastic sandwiches. Their chain stores are good but not fantastic. 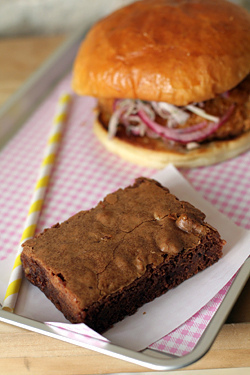 The fried chicken sandwich with a brownie (in Paris!) sounds wonderful. Well, as long as they don’t devolve to the fried french fries po’boy you’re set. 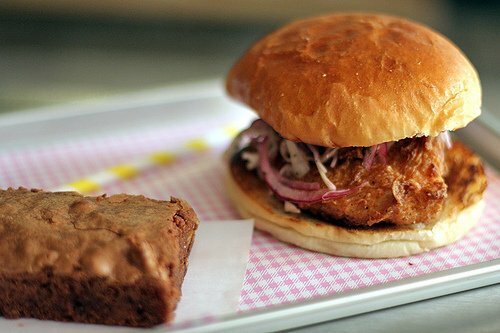 On the picture of the Verjus sandwich board you posted, the fried chicken sandwich is called Bakesale Betty. You think there is any connection to Bakesale Betty in Berkeley? Hooray for ginger beer! 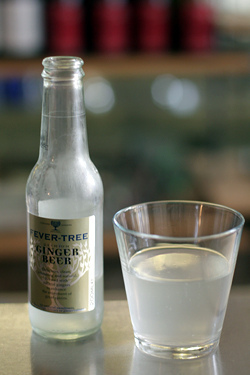 Fever Tree’s is so delicious. Ten more hours until I can go home and enjoy it, and possibly a sandwich, too. Well it seems like fried chicken has truly become an international dish! Living in Shanghai China it is impossible to go more than a few blocks without seeing a KFC. A few weeks ago in a smaller city just 40 min outside of Shanghai I literally stood on a corner at one KFC and could see 5 others from that location. Crazy! There’s some so satisfying about a good sandwich – like all is right with the world. Everything you need contained between two pieces of bread. Yeah … I’d try all three. Have to agree on the Subway comment, even my 6 year old turned her nose up. Somehow the idea of buying your sandwich by the inch, or even the foot, seems pretty depressing in any case. As to Verjus, I just clicked on your link to a previous post about them. I just have to make it over the Channel to Paris vv soon and will be taking notes from your fab blog before I set off. David, You are a writer and cook extraordinarie. Long have I lingered over all your posts, your books, your adventures–but without responding or thanking you. Today, I cannot resist. It is so terribly sad that now Parisians will think KFC IS fried chicken or that those Subway sandwiches are any indicator of American ingenuity. But on to the fried chicken: I was born and raised a (Louisville) Kentucky girl and have been eating and cooking fried chicken all my life. (a small side note here: my mother was a friend of the Colonel and his wife–both quite charming, btw–and the original KFC in KY was actually good–pre-cooked in a pressure cooker and with a crisp crust. It was nothing like the sodium-soaked, grease engorged specimens it is today). My mother made fried chicken in the old southern way–chicken soaked in buttermilk, then shaken in flour and seasonings in a paper bag, then fried in a cast iron skillet in a combination of lard and bacon grease. It required a lot of tending and watching, lowering and upping the heat,etc. I’ve been making variations of her method for 50 years until recently when I began to experiment with Korean fried chicken. I am sure you are familiar with the fabulous fried chicken at Korean restaurants. Anyway: the best ever! Like pommes souffle, it’s a two stage frying process and the coating is rice flour and/or cornstarch not wheat flour. Anyway, get back to me if you want to discuss further. Meanwhile, All Best–in life and in cooking. Verjus is near and dear to my heart – I pine for that little jewel box of a place a lot after magical meal there with good friend post great business meeting – but I am surprised at how conflicted I am on the migration of pulled pork to Paris. It is quintessential in some ways, that nature or idea of a sandwich here in Austin, in some fabulous tacos, etc. And as much as I love how Paris has evolved over the past 20 years into becoming more user-friendly and less uptight in the food realm (Anthony Bourdain was spot on for that episode on Paris)-and love how urban Paris re-invents itself architecturally, even I the self-appointed president for Austin’s fan club for Paris wonder how much more global-ness/”Americanization” in the food realm might mitigate whatever we on the outside consider “Parisian”-ness. We will probably never see in Texas such a great baguette as that as in the gorgeous picture you have of the mouth-watering sandwich (Easy Tiger on East 6th Street does a pretty dang good one though), however, so I will definitely enjoy making many visits to Verjus (the wine bar I presume) in June to get a pork fix – in a still quite Parisian way. À bientôt! Alice: Yes, the three sandwiches currently on offer are inspired by their American counterparts. They will likely change from time-to-time, perhaps. Suzanne: For such a long time, the only reference so many people had to “American” food was fast-food, since that was what was being exported into other countries. Fortunately people have traveled more and more to the US and seen that our food is not just fast-food, but a whole range of things. Still, the fast-food places have really proliferated but it’s encouraging to see folks being offered alternatives to fast-food. Sylvia: It’s funny because I used to get the chicken sandwich from Paul most of the time, but the poppy seeds on the roll were always getting caught in my teeth. And if I was walking around Paris, I always felt funny because I was afraid I had little dark specks in my mouth! 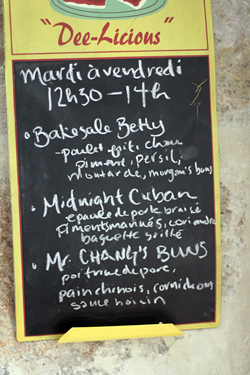 They know what bakesale Betty is all the way in France? That really surprises me. I was stuck staying at a hotel near an airport in the US and the 2 dining choices were Subway, and Burger King. I opted for the chicken sandwich at Subway, and the counterperson pulled out a tiny plastic bag of pre-portioned chicken cubes (which were about the size of peas) and distributed them insides a log of puffy-soft bread. And the rest of the ingredients were pre-portioned out, and put on it as well. Good gosh, is it really that hard to put a few slices of chicken on a roll? I know it’s fast-food, but it would be great if they could re-imagine their sandwiches. I don’t know why people line up at lunchtime in Paris when there are so many bakeries serving sandwiches. I’ve eaten at Hidden Kitchen twice and Verjus once. I am not surprised that whatever they make is absolutely delicious. However would I cross the Atlantic in search of pulled pork or fried chicken? Maybe not. I absolutely understand those cravings when living full time in France though. And if it showcases American food while avoiding Subway or KFC, then all the better. The strangest site for a Subway in Paris is at the end of Rue de Nil. After eating at Frenchie Bar a Vin, my teenage son was still (!) hungry and eyed up the Subway a deux pas from the restaurant. Having a branch near his school back home, he knew to pass right on by and waited until we got to our apartment to fill up on toasted Poilane with 36 month aged Comte from La Fermette. A tough life! I know. It’s weird to see it there. I was admiring a vacant corner on the rue de Bretagne for my potential ice cream shop (! ), until it opened as a Subway, too. I hate the sandwich craze. It is hard these days to get a meal at lunch in the Berkeley or Oakland. So many good restaurants wither aren’t open for lunch, or only serve sandwiches. Whenever I’m in Paris, I have to head to Rue Mouffetard, to one of the unassuming/touristy sandwich shops for a panini. Not very fancy or well-regarded either but I just adore them (jambon, fromage, tomate)! Then it’s off to les Arenes de Lutece for a little pique-nique. Verjus definitely looks like a step up. Subway is invasive! I saw one in Delhi. On another note I had some of my favorites growing up in Baltimore. Soft shell crab on white wonder type bread with mayonaise and iceberg lettuce. Sounds awful now after so many years living in Berkeley but it was sure delicious. OMG, it looks so good. Just wondering though if it possible for a gluten free celiac disease person to eat anything in France. Yes, check out my post Gluten-Free Eating and Dining in Paris. And I just saw a sign for another gluten-free baking opening in Paris, which I’ll add to my list when they do. I have a secret dream in my heart – to open a sandwich shop in Paris, combining great parisienne breads and rolls with the stuffings my friends and family adore when I make them sandwiches. So I think for lunch today, there will be focaccia, sliced, spread with olive oil, filled with a mix of roasted veg (onion, asparagus, tomato, sweet potato) and gobs of chevre, seasoned with fresh ground black pepper and a soupcon of thyme, maybe a bit of lemon rind, and then pressed in a hot cast iron pan. Enjoy your blog very much. Just wanted you to know I am now able to follow it on bloglovin’ and feedly and will be canceling the email because it’s easier on the two new ways. Don’t want to miss anything, but wanted you to know why. I would think the popularity of Subway is that it doesn’t cost $20 dollar for a 15 centimeter sandwich, cookie and a drink. Maybe half that. David, thank you for this and for all of your recommendations, many of which I look forward to exploring on my upcoming trip to Paris. If you find yourself in Boston, may I suggest Cutty’s in Brookline Village for an excellent sandwich. Thank you for your blog! I look forward to reading it everyday! I had no idea the food truck phenomenon had reached Paris. It’s been fifteen years since I lived in Paris as an au pair and student and I love reading your blog and catching up on all of the culinary “goings on”. One day when all of the stars align just right, my husband and I will move to Paris and open up an out of this world taqueria with fresh tortillas from Mil Amores Tortillería and fresh french rolls for tortas. I loathe Subway; their sandwiches ought to be nice as they make them on site to your order but somehow never are! Talking of great coffee in Paris, the other day we were randomly in the 15th and I was dying for the loo – the ones in McDonald’s were locked out of service – so we went to a totally random café just across the road and my husband ordered coffee while I used the facilities, and I don’t know if it was the relief or what, but seriously, it was one of the best “Express”es I have ever had. Absolute heaven! If you are ever in the 15th it’s in Place St Charles, but I couldn’t tell you the name…. Bother. I read half of this and had to go and make myself Comté and jambon braisé au miel paninis for supper. Had to. Oh it all looks amazing, my brother is moving to Paris next month, I’ll have to share this with him. I hate subway too. I just don’t get why American fast food trends are popular in Paris – especially for visiting tourists – the last things I would want to eat in Paris would be American style sandwiches, hamburgers, lobster rolls, cookies, pizza, etc. 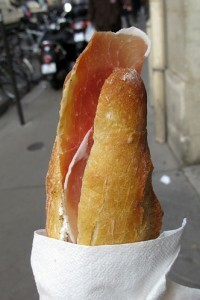 For a quick bite, give me a crispy baguette with jambon and beurre any day, thank-you. There is so much delicious food in France, why would a serious eater choose anything but French? When I was in Paris recently I ate upstairs in the restaurant of Verjus. I am sorry to say it was a terrible meal. It was all – American style cooking badly done, and over-cooked. (And overpriced.) I am aware that the downstairs wine bar is where you are reviewing – readers should take note of the differences between the bar and restaurant. What about the peanut butter cookies and the brownie? I had the same thought when visiting Barcelona – all this amazing food and the only sandwich I can find is jamon con pan? Albeit the best jamon ever but still. Completely agree on Subway too, in college Subway was the only thing open on campus past 9 pm and I genuinely preferred to starve than have Subway…..ick. “Bakesale Betty” on the signboard, eh? Get thee to Oakland and stand in line. And yes, ditto on Subway. How CAN you f-up a sandwich? I’ve never had a Subway sandwich, but they look like the most disgusting thing in the world, even in their TV commercials (of which we get several every hour here, I’m SO sick of them!). Haha! I hate Subway as well. It’s convenient I guess, but the amount of vegetables to meat is ridiculous, and although I am aware that you can ask for less lettuce, they don’t need to fill a sub with lettuce and then two slices of chicken. As to the fried chicken; yum! Hehe… I love eating fried chicken in South Korea, and my umma’s fried chicken even more. Unfortunately, she doesn’t make it that often, but that’s fine, because I also love kimchi bokum. Have you ever tried a Korean fried chicken recipe or made kimchi bokum bap? that flat bread looks amazing! also, subway is definitely gross. I once had a subway sandwich and was very disappointed by the taste even with the extra slice of “cheese” that cost me 50 cents extra. I found the bread to be “étouffe chrétien”. In my teens, I used to go to Kfc, like every week end. The one at Chatelet les Halles. At that time, it was the only one in France and it was cool to hang out there. It was always packed with people. It still is. Now they are everywhere but oddly, they are always empty except for a few customers from time to time. I really like your blog. It’s full of bonnes addresses. And pardon my English, i’m still learning. 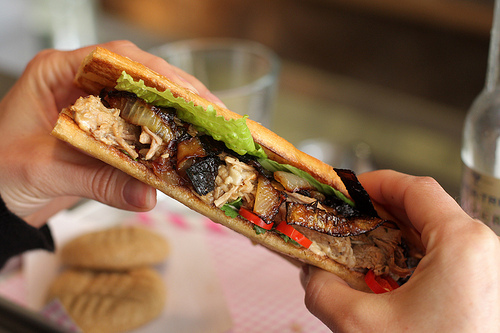 P.s: have you tried the banh mi at saigon sandwiches, in Belleville ? The best I ever tasted in Paris. you know, i was convinced, absolutely CONVINCED, that opening sandwich was oil-packed tuna and roasted eggplant, smattered with roasted red peppers, some bracing greens, and, ideally, a hit of verjus. who cares that, upon reading, it wasn’t. now i want the myth, not the reality. thanks for the inspiration, however faulty! 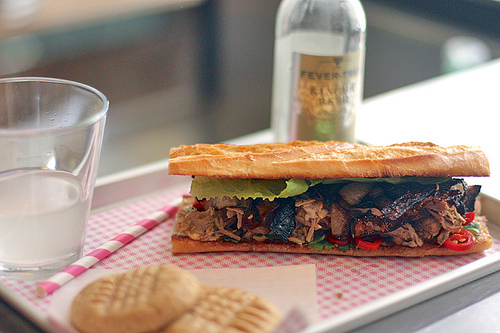 I had the best sandwich of my life by chance at Kooka Boora – upper rue des St. Martyrs. On a baguette cerales, with a smear of black olive tapenade on one side and vinegrette on the other. The filling is semi-seche tomatoes, shavings of Parmasan, mesclun or some other green, plus a touch of prosciutto.(5€). You have to get there early because they sell out fast. Or you can make it yourself pretty easily. Out of this world good. 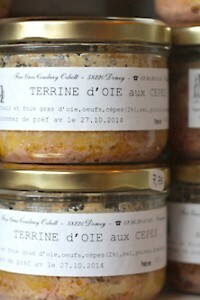 I saw the title, excited to read about a new French condiment for a nice Parisian sandwich, but….oh well. Funny, no one has mentioned yet the most delicious sandwich of all, roast beef (often with provolone and sautéed onion) on a baguette ‘au jus’! Can you find these in Paris? Subway is very healthy, and excellent, as fast food restaurants go. Just the same, it is peculiar to see the fast food chains so popular in countries that abound with their own fine, flavorful, locally sourced and prepared, history and culture-rich, food dishes! molly: Glad you found inspiration for making your own sandwich – sounds great! deedee: Yes, I like their banh mi sandwiches however someone told me that the fellow that owned it sold. I don’t know if that’s true or not, but hopefully the sandwiches are the same. Carol: I’ve not seen a roast beef sandwich in a bakery (I think it’s too expensive, perhaps?) but the Bar de la Croix Rouge in the 6th has an excellent open-face roast beef sandwich on the menu, to eat in. I had dinner all sorted and now I want a sandwich. Any one of the three mentioned would do. My container of lentil soup with yams pales in comparison to that juicy looking sandwich, wish I had it tucked into my lunchbox instead! Bakesale Betty’s is handsdown the best fried chicken sandwich around! It’s located in the Temescal district of Oakland, CA. You will have to get in line, she is open 11-2 pm only. Once the sandwiches are gone, you are out of luck! Oh, don’t forget to also order the strawberry shortcake! True bliss! Janet, I’ve had lobster rolls here in Québec with good bread. Lobster is much more expensive in France than in northeastern North America. And of course pizza isn’t USAmerican, though it has developed and changed everywhere there was a large Italian emigration. I too thought this thread referred to unripe grape juice. KFC seems weird since it is simply so bad. Southern-US-style fried chicken wasn’t so known in Paris, but there were a lot of excellent examples from the former Indochina. I associate KFC with arriving at rue POULET just outside the Château-Rouge métro and West and North African young people (more black than brown, unlike Barbès one métro down, where there are more North Africans, but it all blends in) ingesting KFC. Not only rue POULET, but there was a busload of CRS there (cops are also called POULETS in France, which might be nicer than pigs). I got to my friends’ house nearby, and you guessed it, poulet, but in the form of a nice chicken tagine a Moroccan friend (who hates KFC) had prepared for us. 2) I await that magical day that you finally extend your bon mot French words into a complete sentence…in French. After four months in Paris I would travel across town for a friend chicken sandwich as good as the ones at Bakesale Betty’s in Oakland. Ohhh the slaw, the chicken, the magic. I need to hotfoot it over to Verjus and I’m hoping to see hipsters clutching KFC on the way! While that one might have been tasty, it really doesn’t even look close to how delectable the real Bake Sale Betty fried chicken sandwich really is! :) Just has some Bake Sale Betty not too long ago and it still is wonderful as always. We love Braden and Laura (owners of Verjus) and ate at their wine bar 3 times last time in Paris! I had no idea they served lunch! Can’t wait to go back. I’m sure David knows but just to share with everyone else: the owner of Bakesale Betty in Oakland’s Temescal neighborhood is also a Chez Panisse alumni; Alison Bakarat was a baker at Chez Panisse for I think several years before opening up her own place, but I think she was there way after David left CP. It’s incredible that anybody in Paris knows about a tiny (but amazingly popular – http://www.yelp.com/biz/bakesale-betty-oakland) SF East Bay sandwich shop. This is a mile from the hotel where we’re staying in October. We will for sure be going there for lunch!